In 2014, UNICEF launched the first UPSHIFT program ever in Kosovo. UPSHIFT seeks to create youth-led social impact programs by providing them with the necessary skill training, financial resources and mentorship. The Kosovo program achieved some impressive results: More than 126 youth-led projects have been implemented, more than half of which continue even after their engagement with the Lab comes to a close. From these 126 projects there are approximately 61,056 youth directly involved or directly benefited, and 120,630 youth are indirect beneficiaries of these projects. Why did we bring UPSHIFT to Viet Nam? Nearly 43% of the total population of Viet Nam and 45% in Ho Chi Minh City, where UPSHIFT is being piloted, are under the age of 25. With 20 per cent of 12-18 year old children out of school and 85 percent of youth between the ages of 16-30 not having any technical training, the Vietnamese youth population is large yet unskilled. With a strong local entrepreneurship ecosystem with emerging governmental support, and the large youth population (Over 4 million people under 25 just in Ho Chi Minh city! ), the UPSHIFT Social Impact Workshop framework provided an appropriate methodology for piloting. 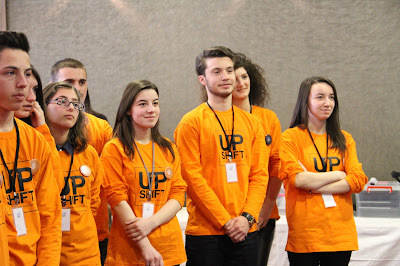 In piloting UPSHIFT, a pillar of the larger By Youth For Youth program, it was critical to empower youth people participating in the program as partners and leaders. We partnered with an organization with the mission of “For Students, By Students”. 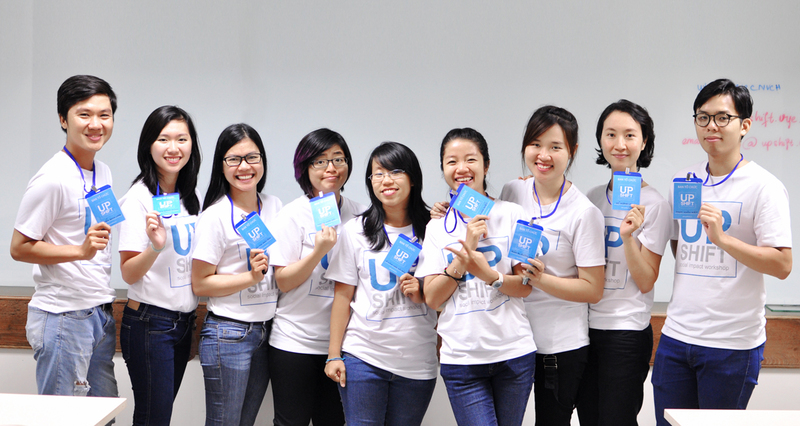 Founded in 2011, Viet Youth Entrepreneurs, is Viet Nam's first and only student-run organization for entrepreneurship. Viet Youth Entrepreneurs (VYE)promotes entrepreneurship through bootcamps and trainings delivered by seasoned entrepreneurs and business academics. 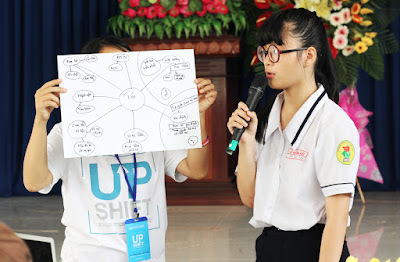 Viet Youth Entrepreneurs is an excellent partner for UPSHIFT because of the common focus on youth development and empowerment, expertise in delivering experiential learning programs, and a keen ability to leverage their student network to have youth-led volunteers that are able to work closely with the participants. 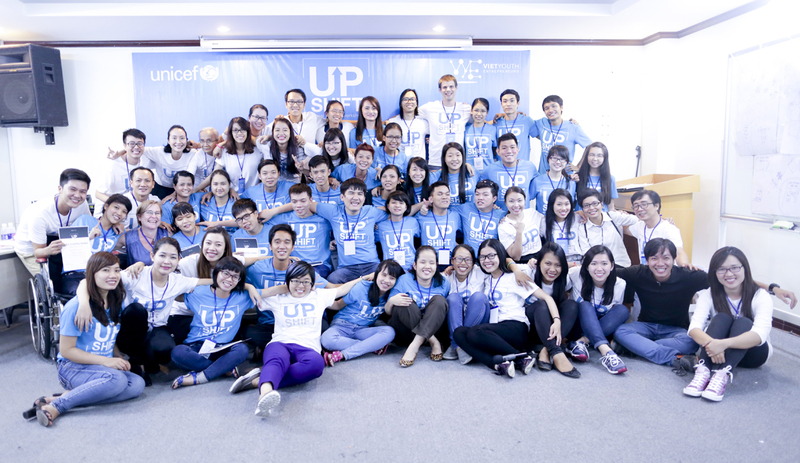 A series of UPSHIFT ‘recruitment’ events took place in October 2015 through UNICEF-supported social protection centres and schools for children with disabilities. We set out to reach 500 adolescents and young people, with at least 30 percent of whom are disadvantaged or marginalized in some way. To help participants identify problems in their communities that they would like to impact, we taught them a mind-mapping method. The idea is simple enough: Put yourself at the center of the map, identify communities you belong to, and brainstorm problems in those communities that you care about. Participants were often confused about how to define a specific problem. This could be because in Viet Nam many social projects start because young people read a story in the newspaper or see a TV report rather than experience the problem themselves. Without the personal experience of the issue they want to solve, we found that many participants were often vague or shallow in their descriptions of the problem. Therefore for groups that could not easily define a problem in depth, we added an extra step: 5W-H brainstorming, using open-ended W-H questions (Who, What, Where, When, Why – How) to help them understand their communities, the needs of its people and how to address those. Participants are able to make the connections between different aspects in their communities and probe further until they arrive at the problem that they care about and can take specific action on. The second challenge presented itself when we conducted our outreach session at the Thien An Shelter for the blind in HCMC. 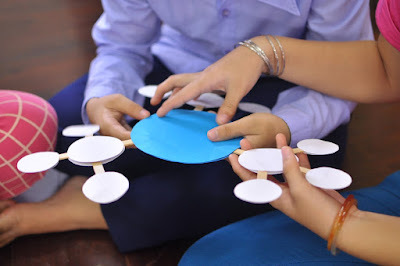 As the crux of our outreach sessions is mind-mapping, a decidedly visual technique, our challenge was to either replace mind-mapping with other activities or to adapt mind-mapping for blind students. We went with the latter because we believe mind-mapping proves to be a great way to organize participants’ thinking. We also wanted to ensure that every participant, regardless of their abilities, received the same opportunity. To prepare ourselves for this challenge, we visited the school to interview the students and their teacher. During our user interviews, we learned that some students are familiar with the concept of mind-mapping. Although they cannot see a mind map, they have read about it. This was a great finding for our preparations. It allowed us to focus less on adapting the technique and more on the delivery of the curriculum. Mr. Phong, the founder and main teacher in the shelter, told us that in order to learn about diagrams, charts and other visual elements, blind students have to have each element of these charts described for them. Mr. Phong suggested incorporating tactile elements wherever possible into the program since students are familiar with learning via touch. Heeding the advice, we created a physical model of a mind map. We made sure that different elements on the map have different tactile properties so the students can easily understand the purpose of each. For example, different-sized circles represent different level of thoughts,( i.e. primary issues, root causes, and stakeholders). This helped those who already had knowledge of mind-mapping solidify their understanding of the concept. The participants in our session received the models with enthusiasm. For many, this is the first time they have had the physical experience of a mind map. 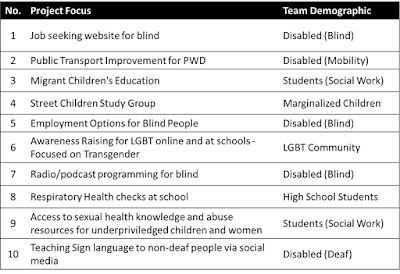 We continued modelling many of the outreach and workshop curriculum and tools so they can be accessed by blind participants. The goal for the outreach phase was 25 sessions for 500 participants over 6 weeks, 30% of which are disadvantaged, and over 50% to be female. In reality we only had 4 weeks to accomplish this, but through strong collaboration and support we were able to exceed many of our own expectations. We did 25 sessions for 681 youth, 36% were from disadvantaged or marginalized communities, and 68% were female. Though the project was focused on ages 14-24 years old, we were careful to ensure the children participated as much as possible, to this end we had 42% of all participants under 18. We also received numerous enquiries and online applications about the project. 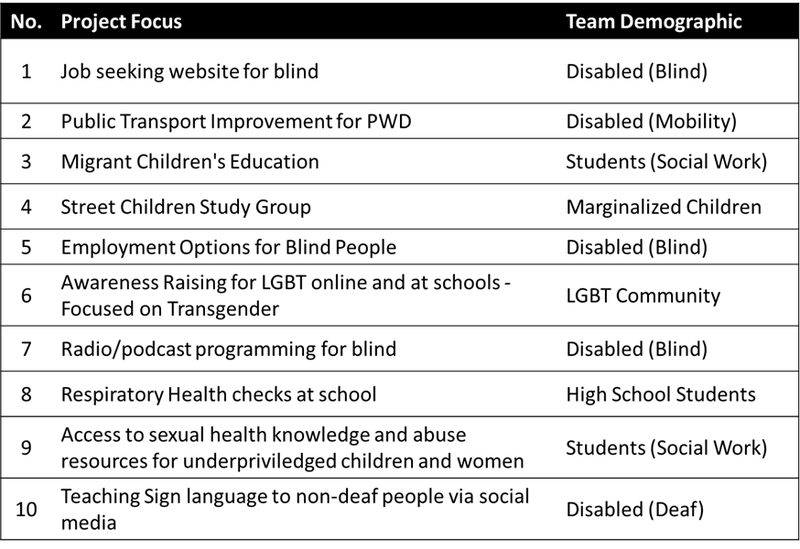 Our next step was to deliver the 2.5 day workshop to these 10 teams. As we worked to adapt the curriculum into the local context (both language and situational), we also worked to ensure that the entrepreneur community would have a role to play in supporting the teams not only at the workshop but also in the long term. For more information on the current progress of our UPSHIFT program, please check out our website at upshift.vye.vn. You can also read the profile of Kim Van and Minh Tuan, two of our participants from the workshop.